Dispossessed Lollipops as Pro-Pigeons Senator is Unfair to Seagulls - Charley Brady - Opinons; My Own. Between my typically shambolic personal life and the global news of recent days, it was a relief to be provided with a laugh from one of our beloved politicians last week. It also made me damned glad that we held onto the Seanad recently. Our lives would definitely be bleaker without some of them and that is for sure. It’s true that we don’t normally associate Fianna Fail members with being sources of humour—not intentionally, at least—so kudos to Kerry’s Senator Ned O’Sullivan who has brought up the important question of Dublin’s ‘seagull problem’, which appears to have reached epidemic proportions, at least as far as Ned’s fevered brain is concerned. The new Minister for the Environment Alan Kelly found himself thrown in at the deep end when the Senator railed on him as to how immediate action must be taken and this scourge on the city way of life be sorted out once and for all. Would this be anecdotal, Ned? 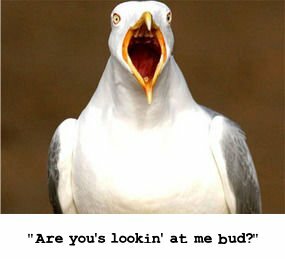 Any hard evidence on the Seagulls from Hell? And yet, Ned, most people in the beleaguered, under- attack streets that you mentioned, seemed to prefer the seagulls to politicians.